Who are you going as for Halloween? Maybe you're headed out as the whimsical Luna Lovegood. If so, you'll need some wild earrings, a dreamy look in your eyes, and an upside-down magazine to read while commuting out to a Halloween party. Any party is pretty exciting for our girl Luna. After all, she hadn't gotten invited to any parties until she went to Slughorn's party in Harry Potter and the Half-Blood Prince. Or maybe you're heading out the outspoken Padma Patil or the daring Cho Chang, either way, you'll need to make sure your school uniform is complete. This tie will top off your Hogwarts school uniform. The blue and silver stripes have a nice, eye-catching sheen with a Ravenclaw shield on the front. 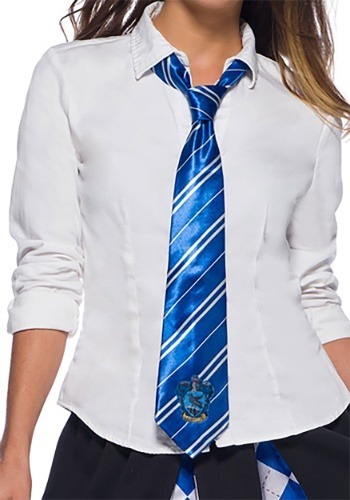 This tie can be paired with the rest of our gorgeous Ravenclaw accessories to make yourself ready for a Hogwarts education! Are you ready to head to Platform 9 3/4? Well, good for you! Just make sure your uniform is all put together! Look into the blue and silver argyle pleated skirt. Or, if you've been sorted into Ravenclaw as a boy, throw on the robe with a black pair of trousers. A tie like this is sure to inspire extra studying, maybe you'll even be allowed into the restricted section of the library. After all, someone who looks this sharp needs as much research material as possible. You never know when all that info might come in handy!